Some statistics about manuscripts in Nature Biomedical Engineering. These numbers are running statistics over 6-month intervals (to smooth out fluctuations in the numbers*). Median values and the graphed interval (minimum and maximum values), are indicated. In any 6-month period, manuscripts can be under editorial assessment, under review, in revision, or accepted. 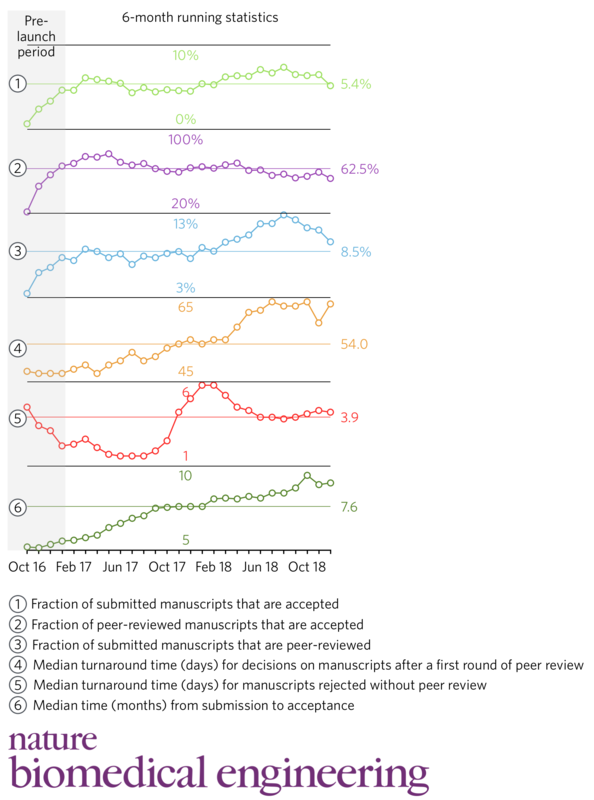 Because 6 months is about the average submission-to-accept time span for manuscripts in this journal, the accepted manuscripts in one 6-month period have typically been submitted in a previous 6-month period. For this reason, for the first few months since the journal opened for submissions (20 April 2016), the fractions of accepted papers are naturally low. The shaded area denotes the time period before journal launch (January 2017). We currently receive about 110 manuscripts and presubmission enquiries per month, a number that has been steadily increasing since launch. It is important to remember that the percentages of peer-reviewed and accepted papers do not apply to individual submissions. An incremental advance will have null or really low chances to be peer-reviewed; conversely, significant findings are highly likely to be peer-reviewed and eventually accepted. * Numbers for the past few months can vary slightly in successive updates of the plot (as a result of the reconsideration of negative decisions and as earlier presubmission enquiries lead to manuscripts considered for peer review). When manuscripts sent for a first round of external review do not include the reporting summary and the policy checklist, the decision turnaround time includes the time needed by the authors to fill in these forms and update the manuscript. In these statistics, manuscripts are counted according to decision dates. Note [July 5, 2017]: the dataset used to calculate line 4 in the graph was incomplete; I have now retrospectively corrected the numbers. Note [August 13, 2017]: I have removed the trending data for the average number of submitted manuscripts per month. These were not representative of the actual number of manuscripts considered (they included presubmission enquiries as well as submitted manuscripts for which we ask for additional information or data before potential peer review and which may not actually be resubmitted). Note [February 4, 2018]: The median time from submission to acceptance is increasing as the percentage of the published manuscripts that needed further revisions or additional revision time increases (in the months around journal launch, we naturally published those manuscripts that moved faster through peer review). Note [June 18, 2018]: It is probably tempting to read into fluctuations and trends in the data, and whether changes in one graph cause changes in another. In reality, many short-term trends are caused by factors that can't be gauged from the data, such as workload fluctuations owing to editorial projects, travelling commitments, and staffing considerations.